I went to Welsh class today. During lunch time, we went to the café in the National Library of Wales. We heard harp music and ate welsh cakes. Even in that little bit, I'm sure there are mistakes. It's very frustrating having just a little bit of a language, so that you can start to say something, then get stuck for words almost immediately. I'll keep trying, though. Corrections welcome! Image pinched from our local chocolatier. 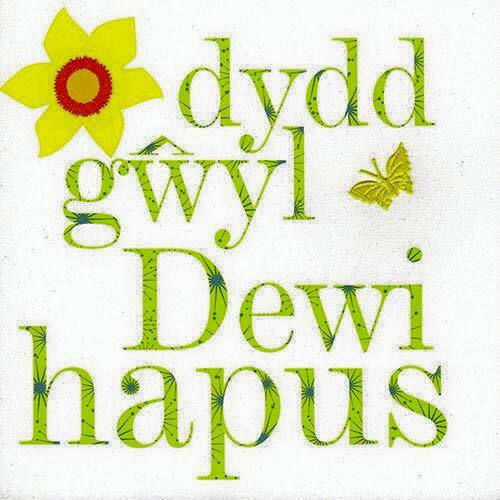 Happy St David's Day to you too! (if a little late...) Some say that babies are the idea people to practise Welsh on, as you don't have to worry about whether you get it right or not! How nice to have a tradition to mark the day, especially one involving daffodils. Well, I have no earthly idea what any of it meant, so it looks good to me! I've never heard of St. David's Day either - is it a Welsh holiday? The bit immediately underneath the Welsh is (probably) a translation. St David is the patron saint of Wales, so whilst not an official holiday, St David's Day is widely celebrated as a national festival. Such celebrations will likely involve some or all of: Harp music, poetry, choral singing, daffodils, Welsh cakes, bara brith (also cake), and cawl, which is soup containing root vegetables, leeks, lamb and cheese. Yes, lamb AND cheese, which may be in quite large chunks.